A new report from the U.S. government on the impacts of climate change on society indicates that unless action is taken, climatological events could cost the country nearly half a trillion dollars annually by 2090. 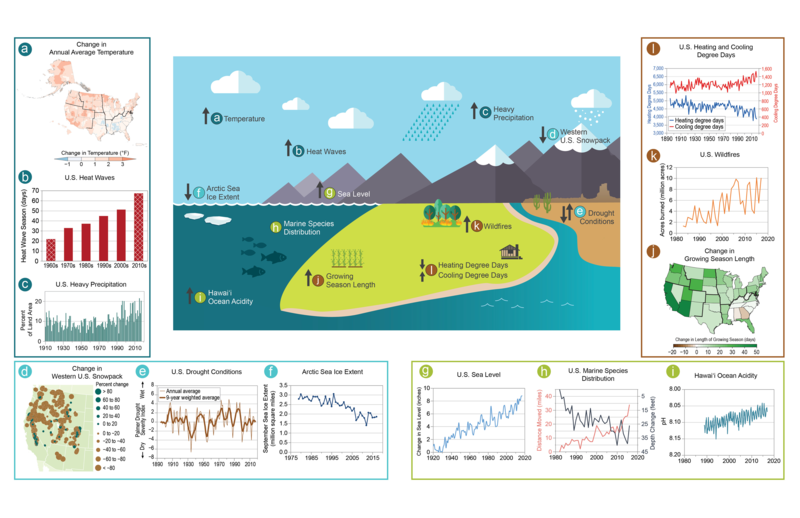 The National Climate Assessment is a Congressionally mandated report on the impacts of climate change and was culled from the work of 300 authors in a dozen federal agencies. The 1,000-page report covers the effect of climate change on agriculture, labor, geography and health in the United States. It’s the second volume of a report intended to give federal policymakers information on how global warming will impact the United States. It also comes at a time when the current administration is doing everything to refute the mounting evidence coming from inside its own agencies and shirk its national and international commitments to mitigating the effects of global climate change. The report provides a stark picture of what’s to come for the United States if action isn’t taken. Many of the changes that climate change will bring to the country will be irreversible, according to the study. There is hope that the world can still change course and reverse the effects associated with climate change. In fact, the study says that near-term mitigation efforts should begin showing results by the middle of the century. Ideally, it’ll let scientists know what steps they’re taking are working and what aren’t. 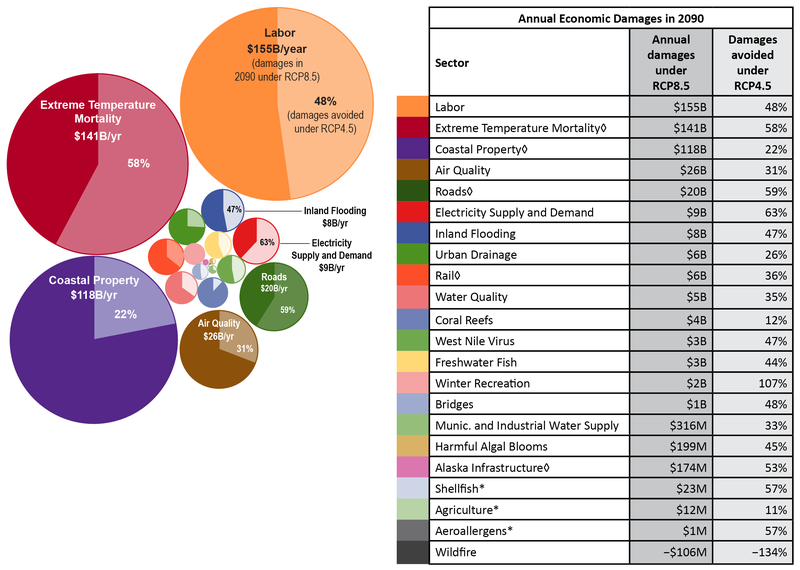 Many climate change impacts and associated economic damages in the United States can be substantially reduced over the course of the 21st century through global-scale reductions in greenhouse gas emissions, though the magnitude and timing of avoided risks vary by sector and region. The effect of near-term emissions mitigation on reducing risks is expected to become apparent by mid-century and grow substantially thereafter. But for the scientists that collected the data and assembled the report, the evidence of the human impact of climate change is now incontrovertible. Observations from around the world show the widespread effects of increasing greenhouse gas concentrations on Earth’s climate. High temperature extremes and heavy precipitation events are increasing. Glaciers and snow cover are shrinking, and sea ice is retreating. Seas are warming, rising, and becoming more acidic, and marine species are moving to new locations toward cooler waters. Flooding is becoming more frequent along the U.S. coastline. Growing seasons are lengthening, and wildfires are increasing. While the federal government may not be willing to take action to curb the emissions that contribute to global warming, states, led by California, increasingly are developing legislation to mitigate or reduce carbon emissions and to create adaptation strategies for dealing with a warming climate. Venture capitalists also are beginning to commit significant capital to technologies focused on alternative energy generation, energy storage, emissions reduction and energy conservation that all fall under the category of sustainable solutions. Indeed, the public offering for the vegetarian consumer food company, Beyond Meat, shows that there’s a growing market for investments in companies that promote a more sustainable lifestyle. And early-stage accelerator programs like Y Combinator are getting into the game, calling for startups that are developing technologies to reduce the emissions that are contributing to global warming. The new report from the government paints a dire picture for the future if nothing is done, but, as the investment and technology community once again mobilizes to develop potential solutions, there’s a chance that things may not be completely hopeless yet. The critical step will be if the U.S. government will heed the advice of its own scientists and take steps to encourage greater action to what is increasingly looking like the biggest threat to human welfare.